This is a companion urn and is designed to hold the cremains of two people having a total combined body weight of up to 375 pounds prior to cremation. The Nature Through Time companion ceramic cremation urn is crafted in the shape of a classic style vase with a top-opening lid. Small porcelain molded leaves, flowers, beetles and dragon flies were made and arranged around the top of the urn and the lid. After the sculptural work was completed the urn was bisque-fired and painted with undercolorants. The main color for the body was chosen and a lush, realistic palette of colors was selected. Great attention to detail is taken in the process of painting to achieve compelling illusion. The soft satin matte glaze finish is reminiscent of the Arts and Crafts movement of the early 20th century in America. Since each Nature Through Time urn is special and one-of-a-kind, please allow for slight variations in color, texture, and size. Ceramic is made by heating raw materials, usually clay, in a kiln. The word "ceramic" comes from the Greek word keramikos, meaning pottery. Because ceramic cremation urns are often created, or thrown, by hand, please allow for slight variations in color, texture, and size. 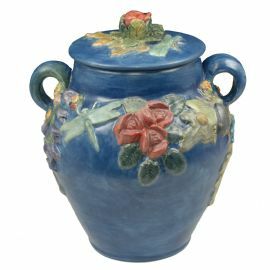 Ceramic urns can be kept at home, entombed in a cemetery columbarium niche or buried in an earth grave. Please note some cemetery regulations may require that this urn be placed inside of an urn vault prior to earth burial.